The Press Freedom Index issues by Reporters Without Borders is a good starting point for assessing journalistic freedoms in global comparative perspective. However, much like all attempts to measure democracy or Transparency International’s assessment of corruption perception, their methodology relies on tallying a number of intangibles that cannot be objectively estimated: Censorship, self-censorship, legal framework, independence. These can barely be quantified and are in any case subject to a wide degree of interpretation based on one’s ideological proclivities; for instance, just how do you go about estimating the degree of self-censorship? I have decided to strip out these elements and focus only on indicators that can be objectively measured, i.e. the numbers of killed and imprisoned journalists set against the size of the national journalistic pool. Using figures from the Committee to Protect Journalists, I tally the numbers of journalist murders from the past three years – to reflect the fact that journalist killings can have a chilling effect years into the future – and the numbers of imprisoned journalists imprisoned now multiplied by six, so that their aggregate weighting is twice that of journalist killings. The reason I do that is because truly authoritarian regimes typically have a tight clampdown on monopoly violence, including on the various independent criminal elements (e.g. drug cartels, rogue intelligence officers); as such, direct killings of journalists tends to be rare. On the other hand, due to the threat of imprisonment and other harassment, independent journalism is severely circumscribed if at all existent. But instead of just going with this figure, I further adjust it to the size of the national journalist pool, because – for obvious reasons – a few journalist killings in a country the size of India is tragic, but nonetheless qualitatively different from the same number of killings in a country with a far smaller population like Honduras where there is a far bigger chance those journalists would know each other. The resulting figure is the Journalism Security Index; a narrower (but far more objective) measure than the Press Freedom Index, which – by necessity – relies on fallible expert judgments on unquantifiable measures such as self-censorship and journalistic independence. Scroll down to the bottom to see the full results of the Journalism Security Index 2012. Some of the rankings will come as a surprise to many people, so let me address those. First, we see a few countries where press freedoms are certainly heavily circumscribed, such as Saudi Arabia, Cuba, and Vietnam, get perfect scores. This reveals the major weakness of the index – it measures not so much press freedom as journalistic security (hence its name). Second, and tied in with this, it only measures the most severe things that can happen to a journalism, i.e. killing or imprisonment. It has no way of accounting for things such as Hungary’s new media laws, the rumored weekly meetings of Russia’s federal TV channel heads with Kremlin officials, or the 42 journalists and counting arrested at Occupy events in the US. Suffice to say that a score of zero on the JSI most certainly does not mean said country is an oasis of press freedom. This is also not to mention that the CPJ has a fairly rigorous methodology for listing a journalist as imprisoned – it has to be political. For instance, while Turkey “only” has 7 journalists listed as imprisoned, other estimates put the number at more than 70. However, according to Yavuz Baydar, a similar methodology may give a figure of 17 imprisoned journalists in the UK for their part in the News of the World phone hacking scandal. Obviously, a line has to be drawn somewhere. Third, there may be surprise that Russia is ranked somewhere in the middle, whereas it is near the bottom on most other indices of press freedom. The explanation is fairly simple. 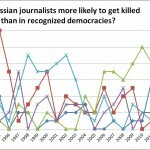 Russia does not currently have any imprisoned journalists by the CPJ’s reckoning, and whereas a total of four journalist deaths are recorded for the years 2009-2011, this is both a significant decrease on earlier years and not a catastrophic situation when set against its 143 million strong population (see Gordon Hahn’s Repression of Journalism in Russia in Comparative Perspective from December 2009) or – to be even fairer – the vast size of its journalistic pool, which at 102,300 newspaper journalists is the largest in the world. On the converse, countries such as Bahrain, Syria, and Afghanistan do really badly because even a small number of journalist killings and imprisonments translate into very high scores because of the hugely circumscribed size of the journalistic pools in those countries. Some may dispute that Israel’s ranking is absurdly low. If so, please take it up with the CPJ. It lists 7 imprisoned journalists; now of them, 3 are under Hamas arrest, so I subtracted them from the Israeli total and gave them to Palestine. Nonetheless, that still leaves 4 Palestinian journalists that are under Israeli imprisonment, all of them without charge. (In contrast, the sole Russian journalist listed as imprisoned in recent years was one Boris Stomakhin for “inciting hatred” and “making public calls for extremist activity”, writing things such as, “Let tens of new Chechen snipers take their positions in the mountain ridges and the city ruins and let hundreds, thousands of aggressors fall under righteous bullets! No mercy! Death to the Russian occupiers! … The Chechens have the full moral right to bomb everything they want in Russia.” One may dispute the ethics of imprisoning someone for what is, in the end, still an opinion; but one has to note that prosecutions take place in the UK (Samina Malik) and the US (Jubair Ahmad) for essentially equivalent activities). 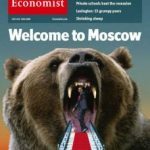 Whereas countries like Brazil and Mexico have essentially free media, they are – as are Russia and much of the rest of the former Soviet republics – terrorized by the generally high background violence of their societies. In the former, this issue is particularly problematic, as Brazil has a much lower aggregate press pool than Russia; therefore, its three murders in the past three years exert more of a relative effect than Russia’s four. Please make sure to note the caveats and methodological clarifications that follow below the following table. Methodological clarifications: Impr. figures taken from CPJ‘s 2011 Prison Census; Kill. figures taken from CPJ’s numbers of killed journalists from 2009 to 2011; #pop. taken from Wikipedia’s list of official statistics on national populations; #journ. taken from UN data on the numbers of journalists per country. JSI(p) is the Journalism Security Index calculated only relative to the population; it is more accurate, in narrow terms, than the JSI calculated relative to numbers of journalists (see below why), but suffers from the fact that it underestimates the risks of working in very populous and poor countries where journalists are low as a share of the population and even a few killings can have a chilling effect on their general community. JSI is the official Journalism Security Index, calculated by (1) tallying the numbers of journalist murders from 2009-2011 and the numbers of imprisoned journalists imprisoned in 2011 multiplied by six so that the aggregate weighting of every imprisoned journalist is twice that of a killed journalist, (2) dividing by the numbers of newspaper journalists in that country, and (3) multiplying that figure by 10,000 to get convenient numbers for the index. There are two very important caveats to be made about the UN data on journalists. First, it only measures the numbers of newspaper journalists, not the total number of journalists and media workers. As such, it should be viewed as a rough proxy. In some regions, newspapers have a much higher profile relative to TV (e.g. East-Central Europe, Russia, Scandinavia); in others, it is the opposite (e.g. Latin America). Adjusting for this would, for example, narrow the gap between in the JSI between Russia and Brazil. Second, far from all countries have data; many of them are fairly important ones in terms of press freedom issues (e.g. Iran, Israel, Mexico, Bahrain). To fix this, I just extrapolated the per capita figures from other countries with similar literacy and socio-cultural profiles, e.g. I equalized Iran and Mexico with Turkey; Israel and Belarus with Russia; Bahrain with Qatar, and calculated their numbers of journalists by multiplying their population by their estimated journalists per capita figures. Needless to say, this is an extremely inexact method, and may be off by several factors. For that reason, countries with no concrete data from the UN source are marked in italics; note that for them, the JSI may be off by several factors (though most likely not by an order of magnitude).